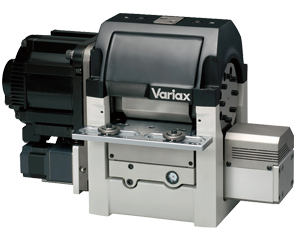 Press material feeders - Variax | Factory Automation in Thailand - SANKYO WORKS (THAILAND) CO., LTD.
Variax is a high performance feeder for pressing machines that uses state-of-the-art drive knowhow based on our outstanding cam technology. With this series, the feed length, board pressure, and gripping force can be adjusted while the device is in continuous operation. This excellent operational control, high precision, and high speed performance contribute greatly to improved productivity during the manufacture of electronic parts and automobile motor cores. 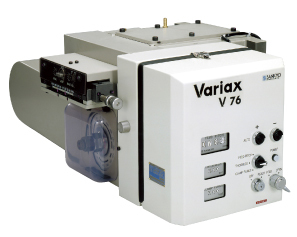 High-speed servo feeder Advanced functionality for long feed pitches and variable feed angles. Servo Feeder for Heavy-duty Applications. High accuracy, general-purpose Wide range of options for handling various material. High speed and functionality, Many adjustable features Built-in support for handling irregularly shaped material. High accuracy and power Long-selling standard model based on performance and reliability. 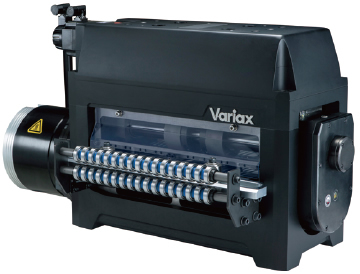 The Variax OPUS1 series is a high-performance servo feeder that is optimal for use in motor core production lines for hybrid, PHEV, and EV car motors. By integrating a high capacity servo motor and roll into one body, it achieves world-class performance. The driving servomotor is operated according to a unique cam curve. Servomotor and cam curves are also used to control vertical roll motion and the release mechanism, allowing the OPUS series to feed thin and soft materials. The controller in the OPUS series is equipped with a large monitor and diagnostic functions. It offers IoT preventive maintenance and diagnosis, as well as good operability. 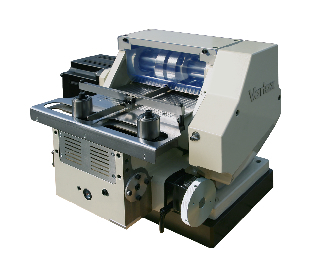 The VS Servo Feeder is a very simple servo driven roll feed. 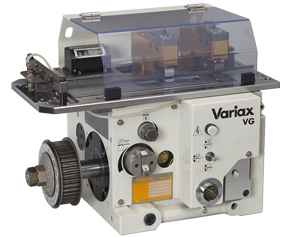 It has a much smaller footprint than our cam-actuated roll feeder, the V Series. And it covers a wide a variety of feeding conditions, such as wide stock material and long feed pitches. Flexible adjustments make this the ideal feeder for high-speed precision precision presses. The large touchpanel controller improves usability, and helps make changeovers quick and easy to perform. ►Feed roll is driven directly by a servo motor for a simple, compact design. ►Proprietary am-actuated release mechanism for excellent reliability. ►Ideal for applications with motor cores, metal bearings, power transistors, and more. ►Available in an optional push/pull feeder arrangement (using standard feeders) for thin-gauge material. The concept of this servo feeder is simplicity. Both upper and lower rolls are servo driven, and operate when a start signal is input from the press controls. Driven upper and lower rolls provide precision and power for a variety of heavy materials. Feed materials with up to 3.2-mm thickness. Applications include motor core stamping and metal bearing stamping. Extremely flexible adjustments allow various handling possibilities, such as irregularly shaped material and long feed pitches. These features make the VR Servo Feeder ideal for mid and low-speed press stamping applications. Also featured is an easy-to-use touchscreen interface and hand-held controller for improved operability and reduced setup times. ►Directly driven main rolls deliver consistent feed accuracy. ►Suitable for a wide range of workpieces, including motor cores, metal bearings, and connectors. ►Performs a pre-programmed feed operation when a timing signal is input from the press controls to allow use with non-crankshaft type presses (such as servo presses). Fine feed with a soft touch. Reliable, high-speed gripper gives good results. This unit feeds materials by gripping them. The combination of four cam mechanisms provides high speed, high precision, and high reliability. Unlike roll feeders that feed materials by rotating the rollers, a gripper feed uses the coefficient of friction to grip materials. Therefore, a gripper feed makes it possible to feeding materials with different shapes and also soft materials. It will not create pressure scars or flaws on materials, feeds in fine increments if desired and can feed at super-high speed. It can also be used as a secondary processing feed. Various types of gripper feeders are available to match your feeding conditions. ►Various types of models are available to match your feeding conditions. ►Combination of the gripper and the clamper is suitable for secondary processing and Materials with different shapes. New type grip feed with adjustable release timing using a handle. To make adjustments without tools, to make fine adjustments during operation, to supply material at creep speeds, the new cam-driven grip feed is exactly what you want. It was developed from the results and experience we have established to improve work safety and operate at high speed. 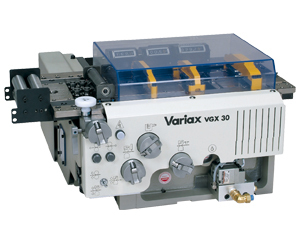 In addition to the excellent features (high-speed, high-precision feeding, and hard to scarred materials) of the VG series, this series lets you adjust for material thickness, feed length, and release timing without needing any tools. Also, fine adjustments can be made during operation. These adjustments can be made with handles (or pushbuttons on the VGX350), and the current settings are displayed by mechanical counters, so that adjustment is truly easy. A grip parameter system is used to adjust the material thickness and gripping force, which means that parameter adjustments can be done simply and precisely, compared with existing models. By improving the usability of the VG series, the VGX series are complete, high-functionality products that can handle a variety of material feed conditions. They have the features and advantages listed below. ►Improved applicability for different material shapes and secondary processing of materials. ►When the material thickness setting is changed, the upper material guide does not need to be adjusted. ►By employing a gate-shaped gripping clamp arm, the material gripping force is improved and the feeding capacity is improved. Cam type roller feed for high-speed and high-precision. This is a high-performance cam type variable roller feed that uses fan-shaped roller segment and four cams. Its feed precision, good operability and workability are widely respected. This feed employs unique and new technologies such as a roller drive on both edges, a parallel level adjustment function between the roller and the clamper, and an absolute digital counter that displays the feed length precisely. Even though more than 30 years have passed since this model was developed, it is still in wide use with presses around the world. ►Excellent reliability by cam drive. ►With the adjustment of the parallelism of the roll and the clamper. ►Ideal for punching the motor core, connector, lead frame. ►This is extensive experience and most established model.